Machine shops, assembly lines, checkout counters, or toll booths are just a few of the places you might find this anti-fatigue mat. Cushioned mat reduces leg and back fatigue. 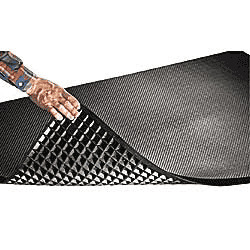 Resilient waffle base with skid-resistant surface. Flame-resistant. Color: black. IN STOCK.